The latest research shows that minimum paid sick days standards and a strong economy go hand-in-hand. The Drum Major Institute (DMI) for Public Policy has just released a report titled Paid Sick Leave Does Not Harm Employment that lays to rest fears that paid sick days legislation may cost jobs. The report examines the effect of San Francisco’s paid sick days requirement on employment by collecting data on San Francisco and five of the counties surrounding the Bay Area. In their analysis, the DMI found employment remained stronger in San Francisco than in surrounding counties without a paid sick days law. Between December 2006 (the law went into effect February 2007) and December 2009, total employment in San Francisco fell just 3% in the midst of the worst recession since the Great Depression (see graph 1). Compare that to an average decline of just over 5% for the five surrounding counties during the same period of time. Although the ‘job-killer’ mantra repeated by opponents to paid sick days legislation is not industry specific, many restaurant associations argue that paid sick days standards will put more pressure on the service industry. (Try to forget, for a moment, that the people serving your food likely have no paid sick leave.) So the DMI decided to take an industry-specific look at the retail, leisure and hospitality, and accommodation and food services industries. What did they find? 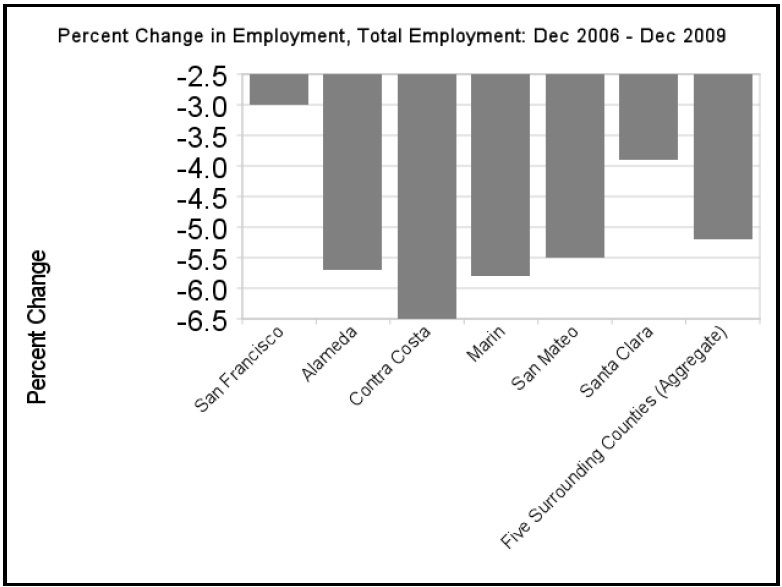 Growth in leisure/hospitality and accommodation/food services was twice as high in San Francisco as in the surrounding five counties, and loss in retail jobs was less than half as much as in surrounding counties (see graph 2). Want more info from the Economic Opportunity Institute on paid sick days? Click here.